East Hants takes part in Nova Scotia Bike Week starting on the first Friday of June for one week. Various biking activities and events will take place across the Municipality. Any groups or organizations interested in being a part of bike week and hosting an event please let us know! Contact us by email or call 902-883-3387. Participate in our Bike Week events and have your name entered in a draw to win a new bike! During this week, students are encouraged to bike to school. Prize draws will happen for those who participate and ride their bike to school! One out of five Surprise Bags contains an autographed item, along with goodies that include sports cards and trinkets to share with your friends! Visit the Elmsdale Branch Library during Bike Week and borrow a sports-related title and fill out a ballot to win 1 of 10 Surprise Bags. For participants ages 5-12. Lloyd E Matheson Centre 11:00 a.m. – 1:00 p.m.
Join Active East Hants, East Hants Library, RCMP, COP and more to celebrate bicycle safety! Bring your bike and try out our safety obstacle course, measure your peddling power with the speed sign, Tune up your bike and much more! Hants North Recreation Facility 1:00 p.m. – 3:00 p.m.
Join Active East Hants and the Hants North Recreation and Development Association to celebrate bike week! Bring your bike and helmet and test your skills on our obstacle course and get your tires topped up with air! 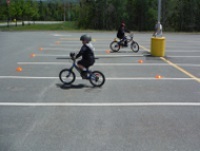 Uniacke Skate Park 12:00 p.m. – 4:00 p.m.
Join Active East Hants and Sport Wheels to celebrate bike week at the Uniacke Skate Park for a bmx and scooter jam! Learn safety, skills and tricks! Coloring Contest for ages 4-6 – coloring sheets can be picked up at the Elmsdale Library. Writing Contest for ages 7-12 – write a short paragraph or a poem with a bicycle theme. Entries must be dropped off or completed at the Elmsdale Library by noon, Saturday June 3. Each Entry is a ballot to win! Looking to host your own Bike Rodeo? Borrow our “Bike Rodeo To Go Kit” and learn about bike safety! The kit consists of the equipment you will need to run the rodeo and a book with the rodeo stations. To borrow the kit, please contact the Parks, Recreation & Culture Department.